Luton Town midfielder Alan McCormack has stepped up his return from injury by being named in the starting line-up for this afternoon’s development game against Barnet. The 33-year-old, who has been missing since Hatters’ 2-1 win at Wycombe on September 16, takes his place alongside former Ireland international Jonathan Douglas, the ex-Leeds and Ipswich player currently training with Luton. James Shea, James Justin and Lawson D’Ath also get run-outs, although Elliot Lee isn’t involved after getting 45 minutes and scoring for the first team on Saturday. 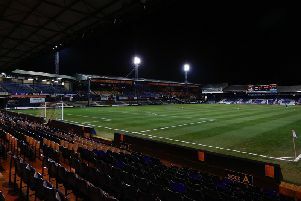 Hatters: James Shea, James Justin, Frankie Musonda, Akin Famewo, Jack Senior, Alan McCormack, Kavan Cotter, Jonathan Douglas, Lawson D’Ath, Jordan Cook, Aaron Jarvis. Subs: Jack James, Harry Isted, Jake Peck, Josh Neufville, Arthur Read.